For the meantime, just sit amazed at the perfection of these late season flowers! 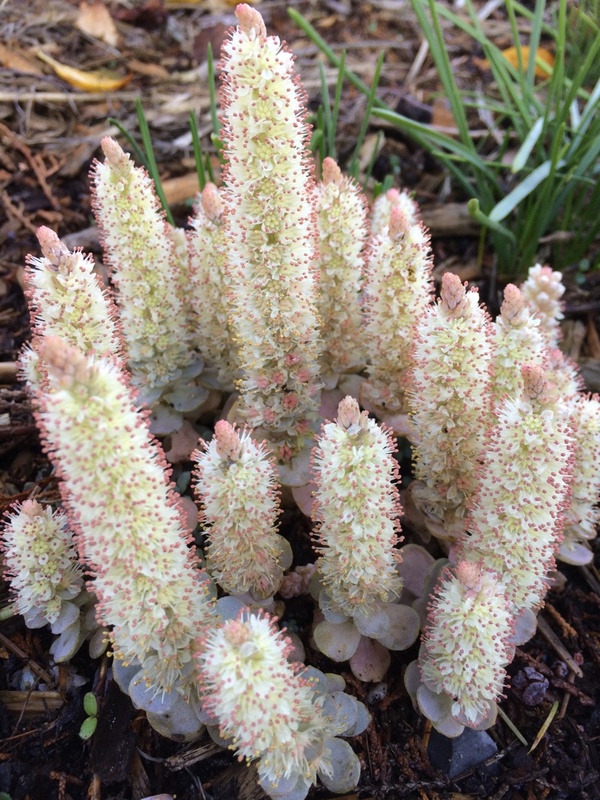 With the uncharacteristic drought we’ve had in coastal BC this year, it’s a good time to consider drought-tolerant, even drought-loving, plants. Before I go any further, most drought-loving plants need to be established with benefit of water before they will be truly drought-happy. There are a few exceptions to that, which I’ll mention at the end, but in general the first year of a plant’s residence in your garden, they need to be babied. 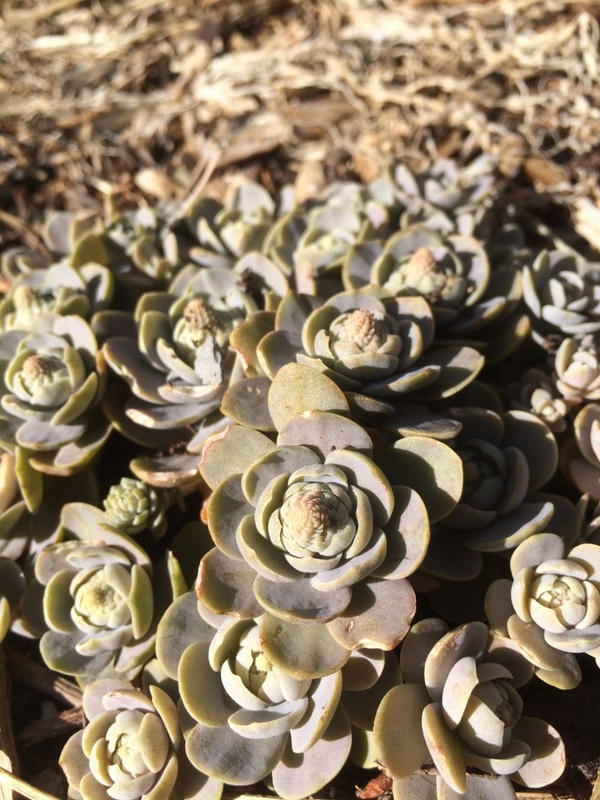 I received this e-newletter the other day, Deborah Silver’s “Silver Leaves”, which inspired this post; really, I’m just going to link you to the blog post, and then explain a little about understanding some drought-tolerant plants. A lot of times you can guess with relative accuracy what plants will accept, even enjoy, really dry conditions. I’ll leave out the dry shade plants, another category altogether, and focus on dry sun plants. The quality of the leaves, and understanding what you’re looking at, will allow you to predict their cultural needs. Very thin leaves, like Mexican Feather Grass (Nasella tenuissima) and lavender (Lavendula sp) fall into this category, as do very tiny leaves, like the creeping thymes. Most strappy leaved plants, like dayliliy (Hemerocallis sp) and iris. 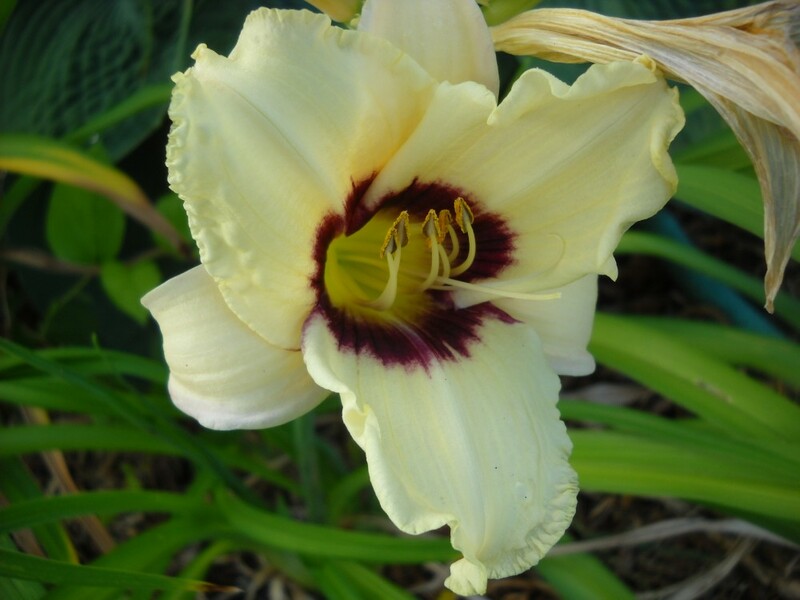 Hemerocallis. These haven’t been watered yet this year. They are in a bit of shade–well, quite a lot of shade actually. The foliage here is fading, but the flowers keep blooming and blooming. In full sun, with no added water at all. You can see the raspberry bushes prospering like crazy–that’s because they have VERY deep roots. Silver leaves often have a fine hairy surface which catches dew and helps prevent water loss. 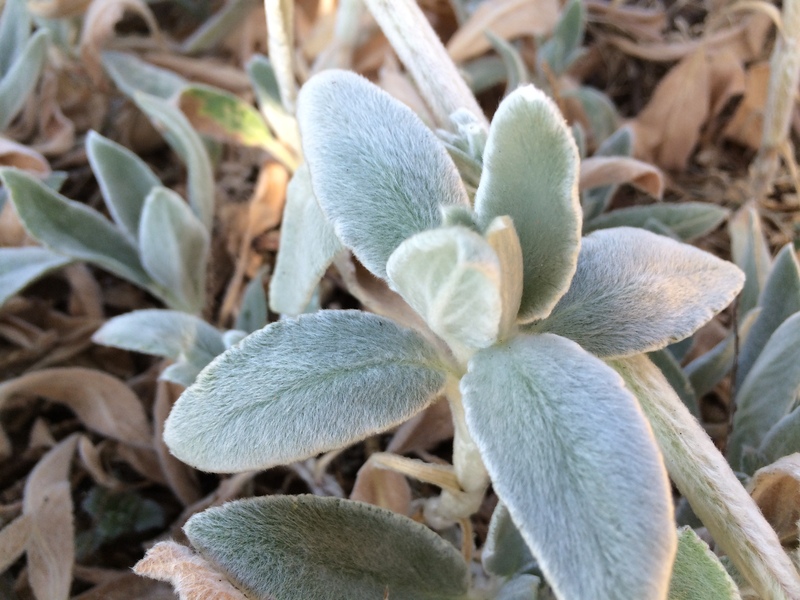 Lamb’s ear (Stachys byzantina) is a classic fuzzy leafed plant. Waxy leaves hold in moisture as well, like many of the sedums, succulents, euphorbias. As Deborah Silver says in the article, silver leaves almost always indicate drought tolerance. So are many blue plants like Elijah Blue Fescue–Festuca glauca, Blue Oat grass (Helictotrichon sempervierens), some of the low-growing sedums like S. spathifollium. Definitely not blue hostas. Last honourable mention goes to those drought tolerant plants that need special attention. And really, I can only think of one right now, mainly because I’ve killed it repeatedly: Lewisia cotyledon: one of my favourite plants, but it just does not tolerate any moisture on its crown. 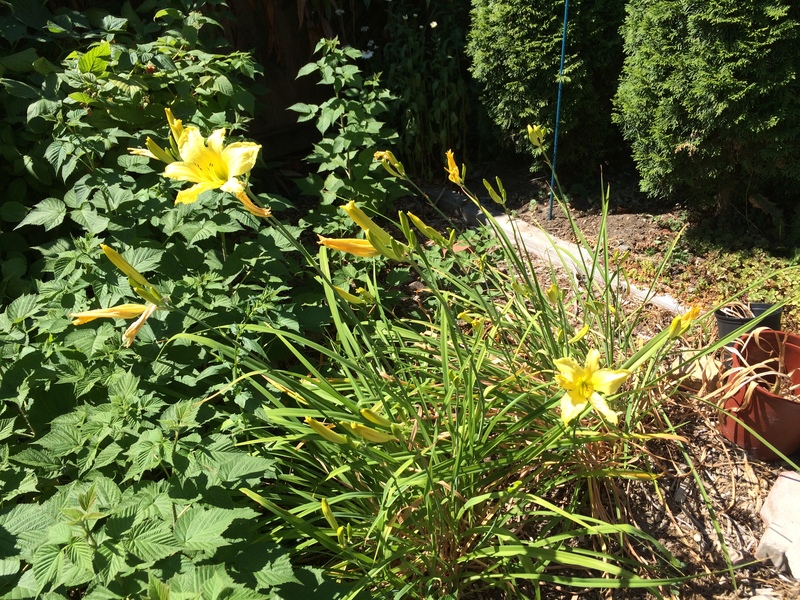 So if you plant it in your water-wise garden, but plan to sprinkle the garden for the first season, make sure the Lewisia is planted a little higher than grade, with a handful of crushed gravel over the soil. It will thank you with thees long-lasting fabulous little flowers. 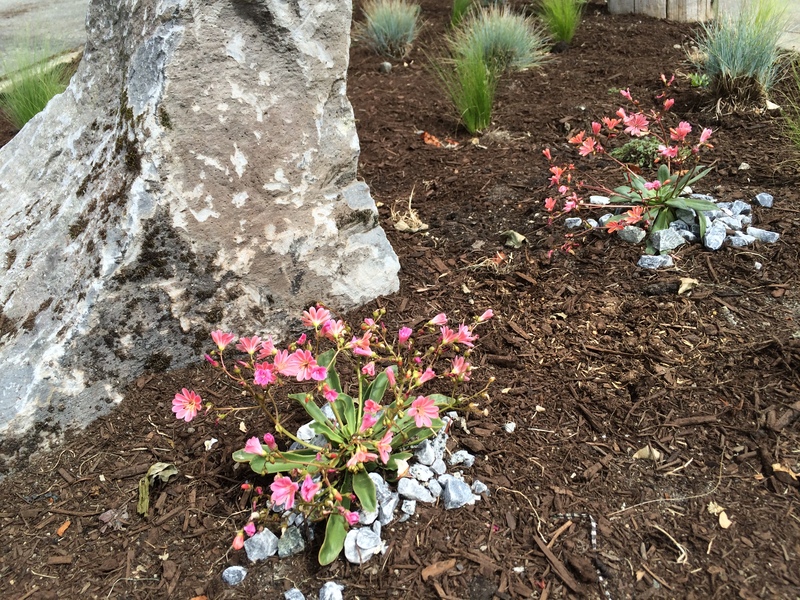 RLGS can help if you’re planning a drought tolerant (“xeriscape”) garden. Go to the Contact page for information. Five Great Containers: Part Last! So I’ll recap the story. And because of its simplicity, that is the idea I gave him. Only MUCH smaller. Container 4 is very different. This is a 16″ container, compared with the other 22″ containers. So obviously it doesn’t hold as much. Intentionally. I wanted some contrast with the sizes, and would have preferred no contrast with the colours, but we took what we could find. The glazing style of all 5 containers is the same, the colouring is different. This container planting isn’t nearly as interesting as the others because everything is still immature. Next year it will look a lot different as everything gets closer to mature size. It starts with a lavender. My favourite, Lavendula angustifulia ‘Hidcote Blue’. This is one of the smallest of the English lavenders, sweet-smelling (never mind that I seem to be the only person in existence who doesn’t like the fragrance of lavender), and rich purple-blue coloured flowers. Here is an excellent video on pruning lavender. 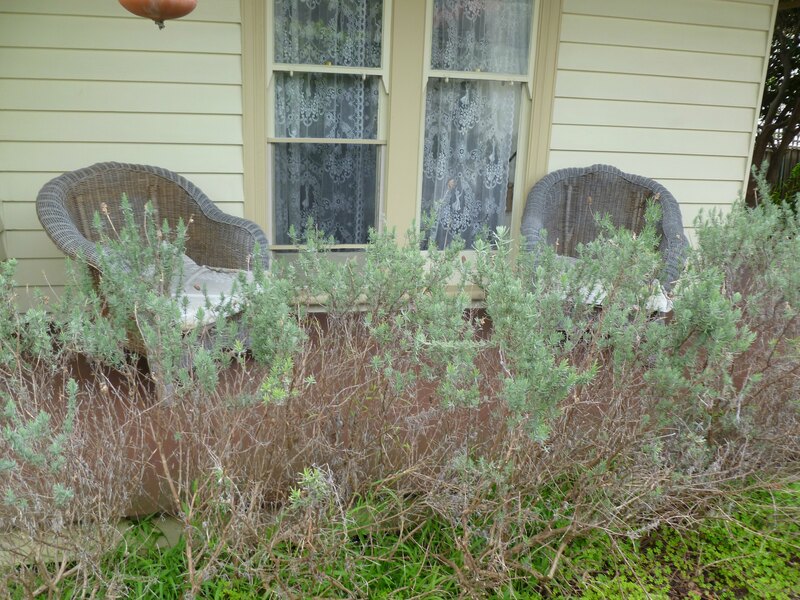 Unless you actively keep your lavender in check, it will get woody and overgrown and UGLY. You don’t want this, I’m sure. Thanks to beingfiftysomething for her picture of her front lavender “hedge”. Which she has since completely changed! Next, and almost invisible because it’s so young, is Verbascum ‘Blue Pixie’. This will give a nice spray of height above the lavender, coordinating nicely with the colour. 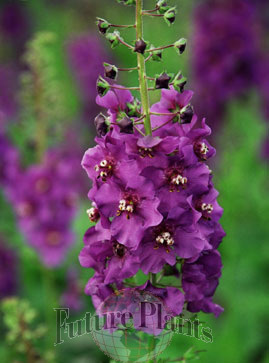 But as the name implies, not grow as high as most Verbascum. Finally this garden is rounded off with the some of the same plants as other containers: the grass–Pennisetum alopecuroides ‘LIttle Bunny’, the spurge–Euphorbia ‘Tiny Tim, and a few strands of the sedum–Sedum rupestre ‘Angelina’. Repeating some plants in your collection of containers gives a sense of unity, and is a principle you can apply to your in-ground gardens as well. One important thing to remember about succulent containers: they need to be treated a little different than other perennial containers. 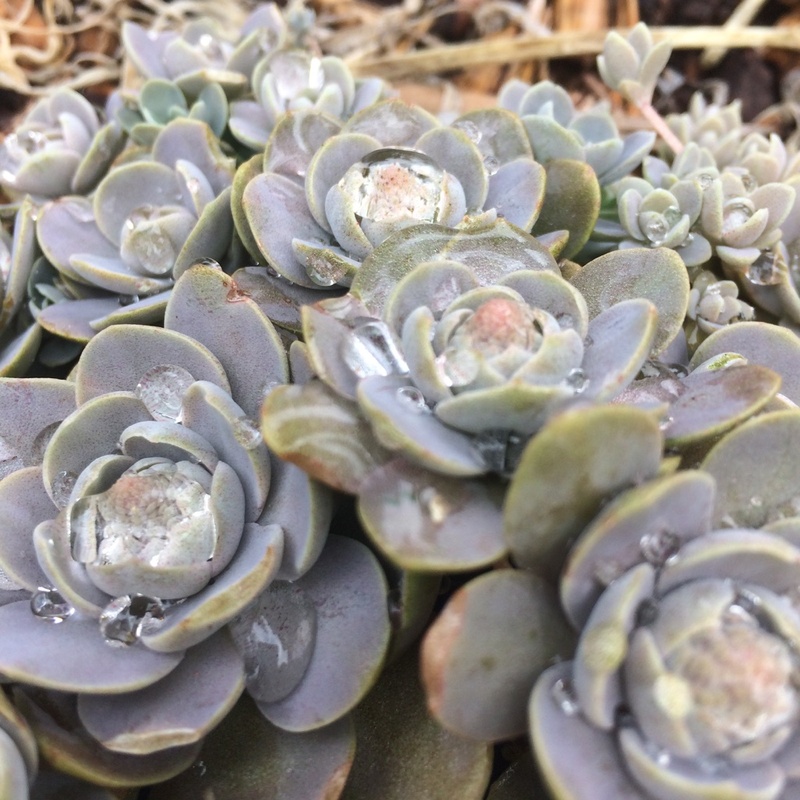 Most succulents grow in closer-to-desert conditions, hence the “succulent” leaves which store water. They don’t want a lot of watering, they don’t want their roots to stay too wet, and they don’t want a lot of wet soil underneath their roots or under their leaves. A shallow container is commonly used, but again, we went with what we could find, so choose the smaller of the coordinating pots. A layer of pebbles would be a good thing to use to mulch the soil and keep the plant leaves from sitting directly on the wet soil. 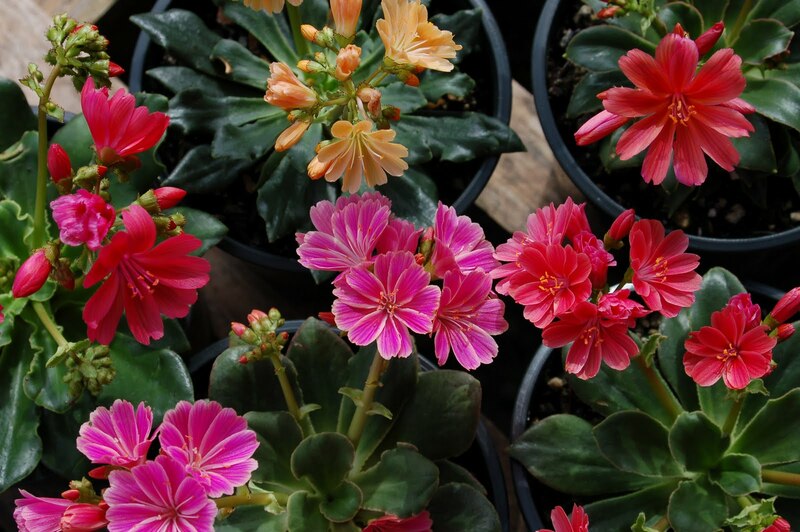 My favourite plant here is the ruffled edge Lewisia cotyledon in front. 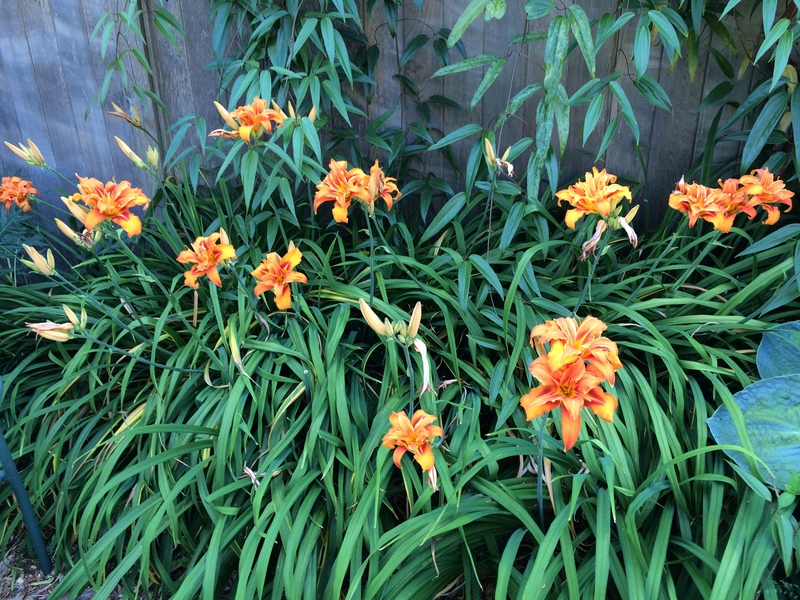 This puts on the sweetest show in late spring, with flowers that range from light orange through various pink shades to almost purple or red. 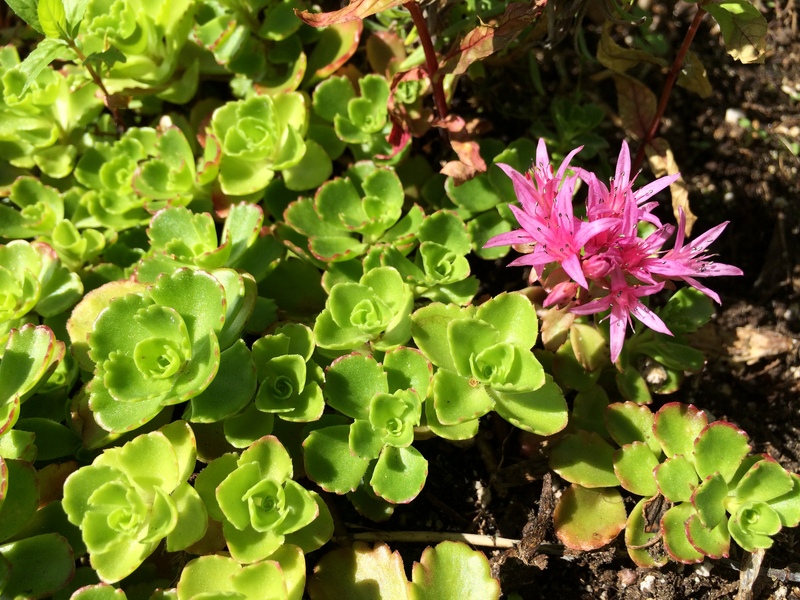 Thanks to Wild Ginger Farms for the picture of Lewisia cotyledon ‘Sunset strains’. 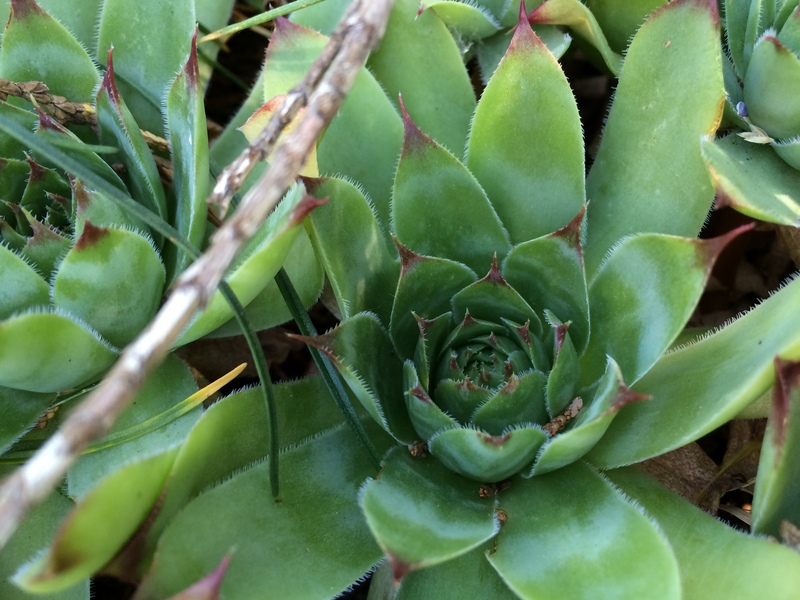 Going around clockwise, next is Sempervivum tectorum ‘Royal Ruby’. I stole a few from the plant to add into other containers, as well as planting a few in smaller pots for a houseplant. Then another no-name Sempervivum hybrid, Pennisetum alopecuroides ‘Little Bunny’, and Sedum rupestre ‘Angelina, and last-but-not-least, Euphorbia myrsinites trailing over the edge. So that’s the end of my series on “Five Great Containers”. Hope you liked it–if so, let me know and maybe I could do another series on some other topic of your choice. As always, leave a comment, ask a question, incite a discussion. Nicely. 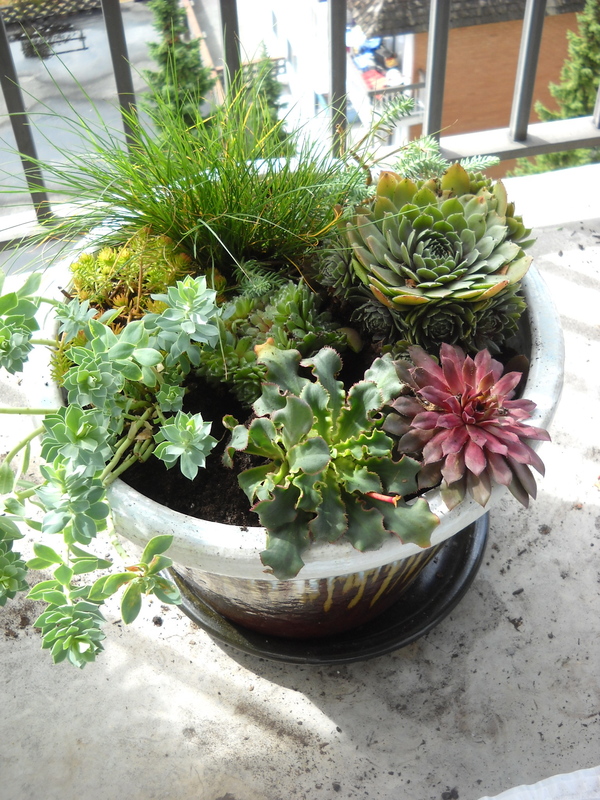 As promised, here’s another container for the balcony garden. 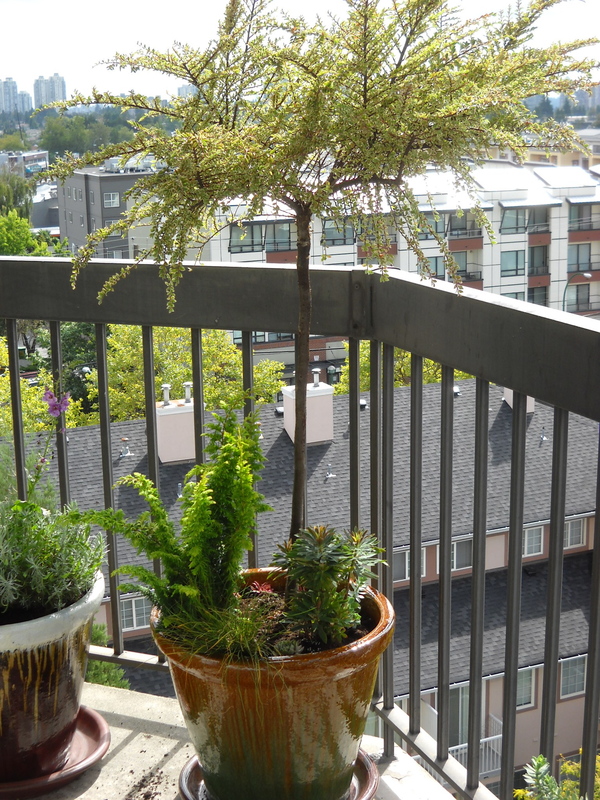 Remember, this is a south facing garden on the 7th floor, with a duplicate balcony above it on the 8th floor, so it gets a little shelter from storms, but is therefore in a rain shadow. Don’t forget to water your outdoor container garden, even if it rains. I planned to use a grafted PeeGee Hydrangea (‘Limelight’) that I saw at the nursery, but they were all gone by the time I returned only a few days later. 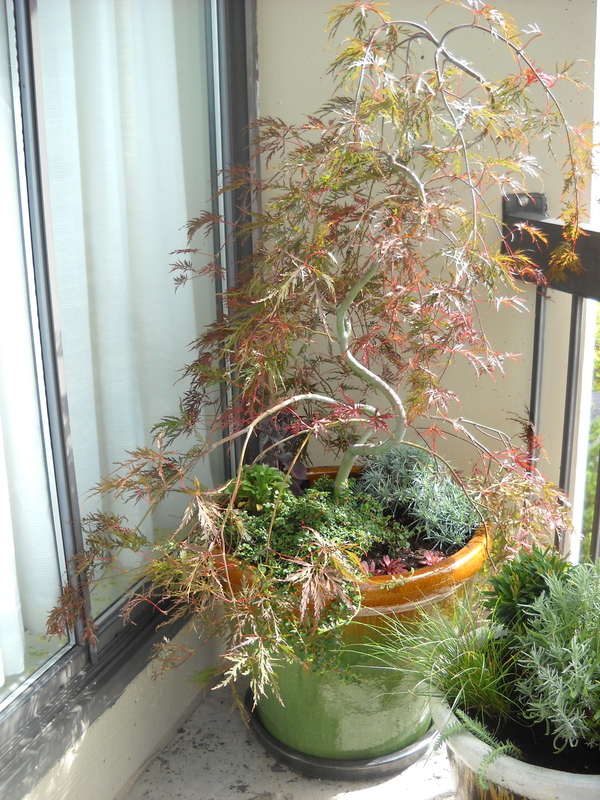 But saw this Japanese Maple, and couldn’t resist. I was pretty sure I’d seen ‘Inaba Shidare’ in the list of trees that tolerated full sun fairly well, so I nabbed it. Japanese Maples are “understory” trees, so in their native environments they receive some shade from the taller trees around them. In our temperate climate, our not very cold winters, not very hot summers makes it a little easier for the JM to tolerate our sun. Besides, this balcony does get a little less than full south facing sun because of the over balcony. This is actually a ground-covering woody shrub, the lowest growing of the cotoneasters. It’ll have flowers in the summer and berries in the fall/winter, and never grow high, but will begin to tumble over the edge of the pot. The colouring will complement the red/green of ‘Inabe Shidare’. All of these will bloom pink, the first a deep almost red pink, the second a lavender pink, the last a rich pink with burgundy foliage. Short ones toward the front, tall one at the back. 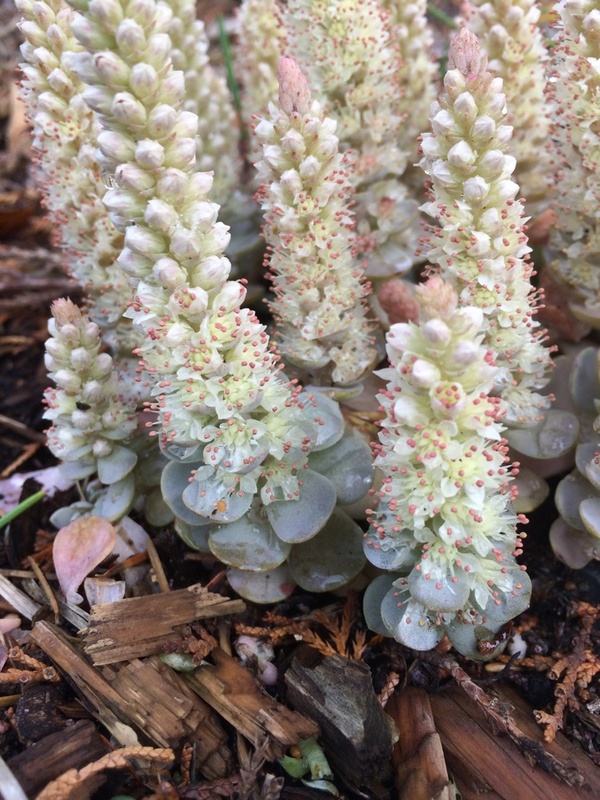 Also called “Hens and Chicks” (but since there’s only individual rosettes here, no mums-with-babes, I’ll call it a Houseleek), it’s real name is Sempervivum. (You can just see a few reddish spikes at the front of the container.) This is a fun red colour, and the pot I bought had a large extended family of rosettes, so I split them up and divided them among several containers. They multiply like crazy, but like most perennials, they “sleep the first year, creep the second year, leap the third year”. I haven’t commented yet on the containers themselves. 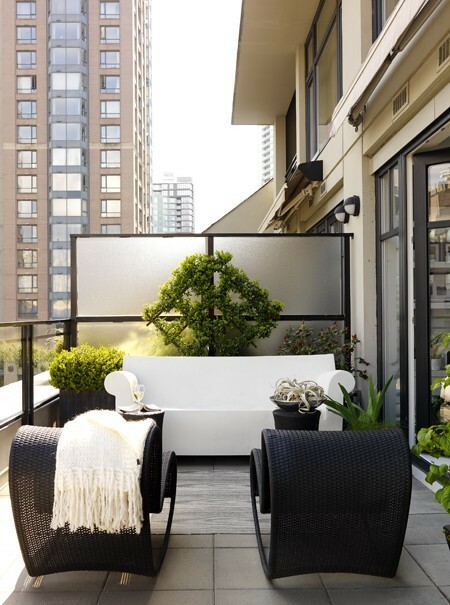 There was nothing about the balcony itself that I could coordinate with, so I just asked the client to find something that he liked, and then we looked for appropriate sizes that would match or compliment one another. Containers aren’t cheap, so when you can find them on sale, it may be worth compromising on exactly what you had in mind for the sake of the significant cost savings. 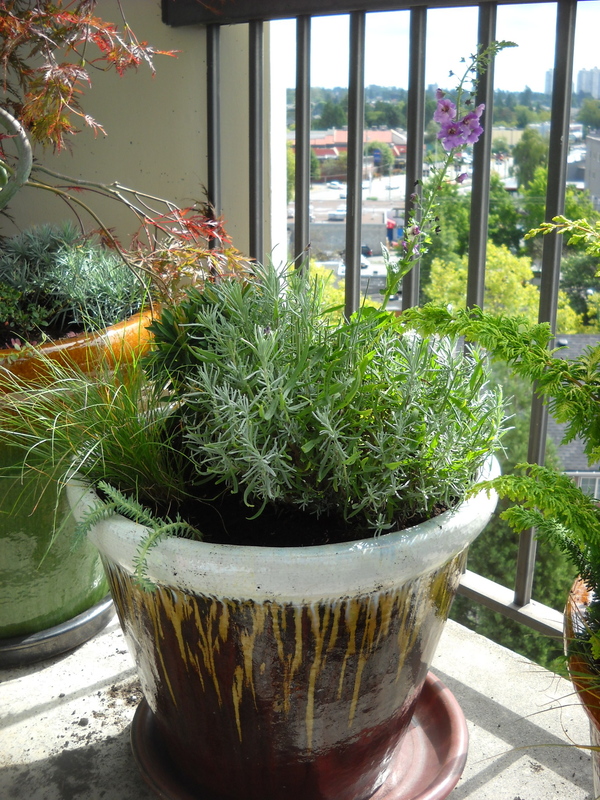 In this case we had a pretty small budget, and yet were able to get the sizes we needed (three 24″ diameter pots and three 18″ diameter pots) and still splurge on the plants themselves. Sometimes you’ll do the exact opposite–the aesthetic of the containers will be more important than what goes in them. This was not that. That’s it for the trees. Next up will be the grafted shrub–what cool idea! Let me know what you think of my creations, and add suggestions. I’m not a big fan of annuals, so you’ll seldom see them in my container gardens, unless they’re annuals that think they’re perennials. But I’m open to any ideas. Questions? Concerns? Leave your comments, and click on the follow button to get instant updates. (Especially with two more “5 Great Container” instalments yet to come!) And of course, like me on Facebook.